The anatomical relationships of the left lower lobe bronchus are similar to those on the right. 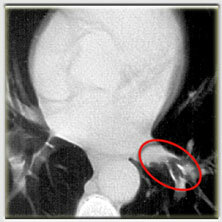 The pulmonary arterial trunk is located on the lateral side of the lower lobe bronchus. It gives off an initial branch to the superior segment, and then others to the basal segments. The inferior pulmonary vein emerges from the posterior bronchial aspect at the origin of the basal bronchi, and is in contact with the airway at this point.